We closed the books on July a few days ago and so it’s time finish up another skill in our Mastery Challenge. 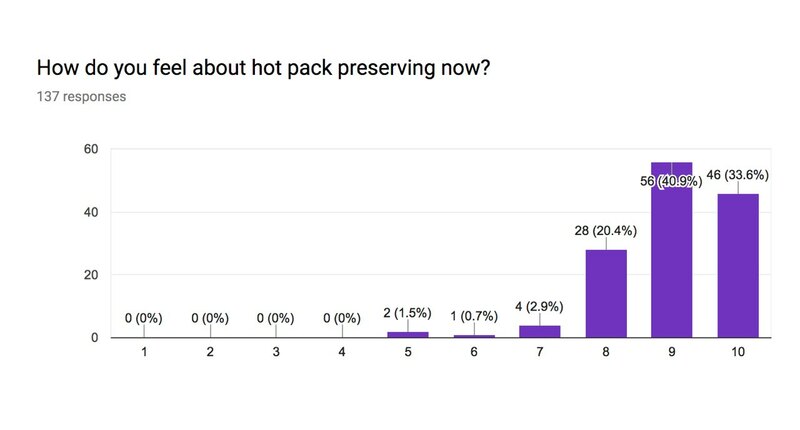 This month, we focused on hot pack preserving and more than 130 of you reported in that you’d tried preserving something using this method. Starring ingredients included apricots, apriums, artichokes, beets, black currants, blackberries, blueberries, cantaloupe, carrots, cherries (both sweet and tart), corn, cucumbers, eggplant, fennel, figs, gooseberries, green beans, jalapeños, kohlrabi, mangos, mushrooms, onions, peaches, plums, raspberries, rhubarb, shishito peppers, sour cherries, strawberries, watermelon rind, wineberries, and zucchini. People made all sorts of products, including chutneys, fruit packed in syrup, jams, pickles, salsas, and tomato products. 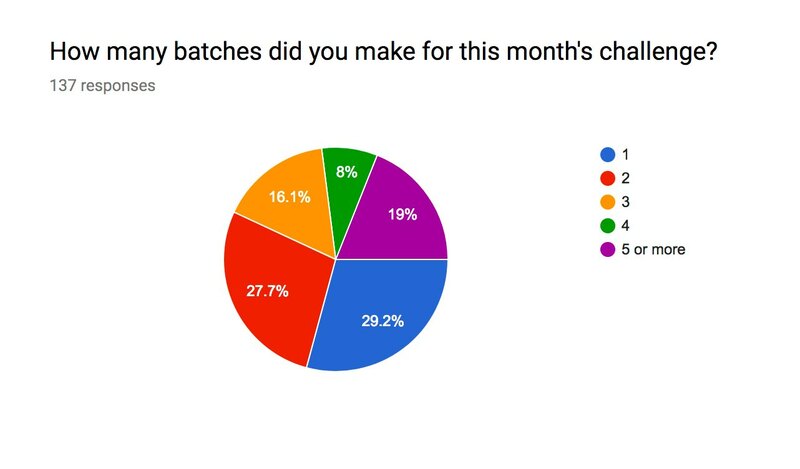 According to the survey, a lot of you made more than one batch, which is always delightful. I’m happy that so many of you were inspired to dig in more deeply. As far as satisfaction with skill goes, the results made me giggle. Most of you felt pretty friendly towards hot packed at the start of the month. But, at the end of the month, those of you who participated were all in. Such happy, positive reactions! Lisa from Aurora, Ontario said, “Interesting to see how the hot pack played out in practice, not just theory. Peaches are a lot more work than I thought they’d be!” So true! Peaches are a beast, but so worth the work! Ann from Vashon, Washington said, “My time was limited and produce was lagging – but the Walla Walla sweets were in so I tried the onion relish. Definitely worth while! 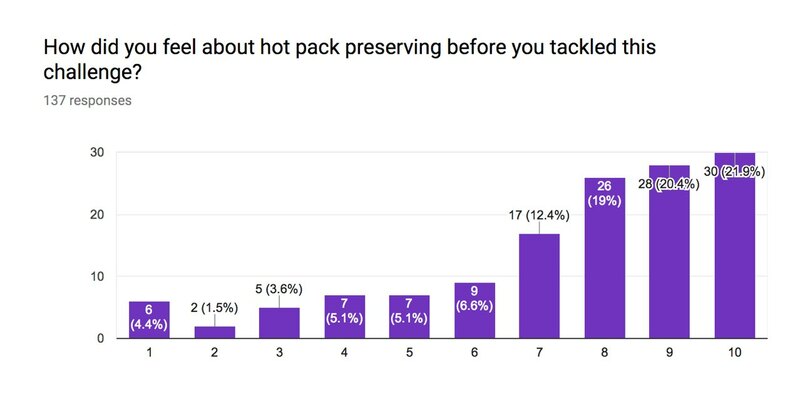 So glad I’m learning more about hot pack. Hope to do some tomatoes soon as they are now arriving in our local markets.” Onion relish is delicious! Tesla from Memphis, Tennessee said, “I had already done a lot of hot pack preserving, but until this month I had no idea that’s what I was doing – or the reasons why you’d use a hot pack with a particular fruit or to get a particular result. This month was an example of how the Mastery Challenges are educational for me, even when I’m not making something new!” So glad it was useful! Submit your July Mastery Challenge Projects! I wish there were a guaranteed way to contact some of my fellow entrants to ask for the recipe they used. Some of them sound so incredibly yummy! Again, thank you for mounting this “challenge”. I am having so darn much fun working with fruit again. It’s been years!! Thank you for featuring my photo!! So exciting! Loving this challenge so far. Best resolution I made for 2017 ( and one I’m actually sticking with).